It began with a simple goal: put Depression-era men and women back to work. Quickly. In the early 1930s, the world’s economy had collapsed. Unemployment in the U.S. alone stood at 25 percent. Many states, even higher. As they viewed the shanty towns and “Hoovervilles,” as homeless communities were then called, many feared that a revolution was coming if something wasn’t done. Then some forward-thinkers, including a then-young Army officer named Dwight Eisenhower, had a transformative, and innovative, idea. Why not change America’s highway infrastructure from mud-rutted roads to paved highways as a way to put people back to work? From the CCC and the ERA to the WPA, Congress and the Franklin D. Roosevelt administration worked through their differences together and saw to it that the men who would move the rock and dirt, and lay the concrete and steel to create what began as the Appalachian Scenic Highway, came from the poverty-ravaged “hollers” and mountains from Tennessee to Virginia that the road’s route would take. 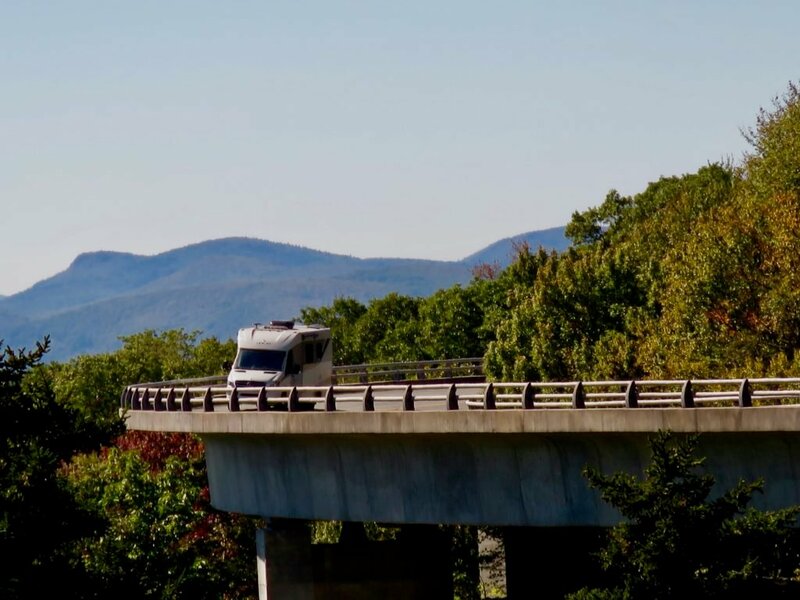 When it was finally completed in 1987—yup, it took that long—this work of beauty winding through, around and over the country’s eastern mountains that became the Blue Ridge Parkway (BRP) would rank as one of the greatest public works projects in American history. The world’s longest, at 469 miles, and narrowest—as narrow as 200 feet—national park would be free except for camping. A free national park that today is the most-visited in the National Park Service, mainly because stretches are often used by locals. It is ranked No. 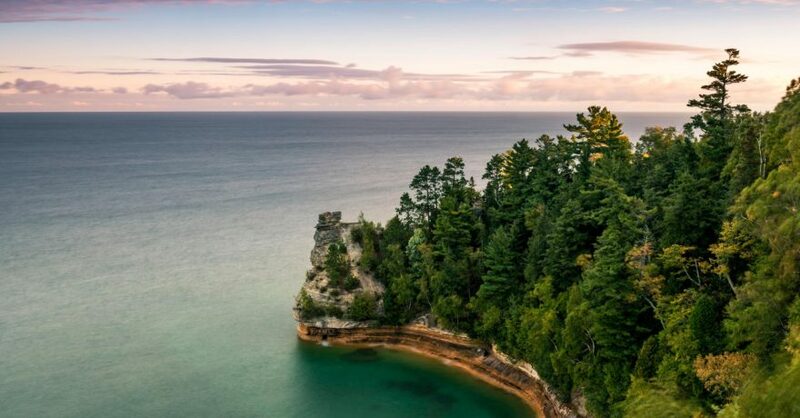 3 in one list of Great American Drives, and should be on yours, too. Linking two great other eastern national parks, Shenandoah, and Great Smoky Mountains, it may not be on your radar to visit. But it should be. 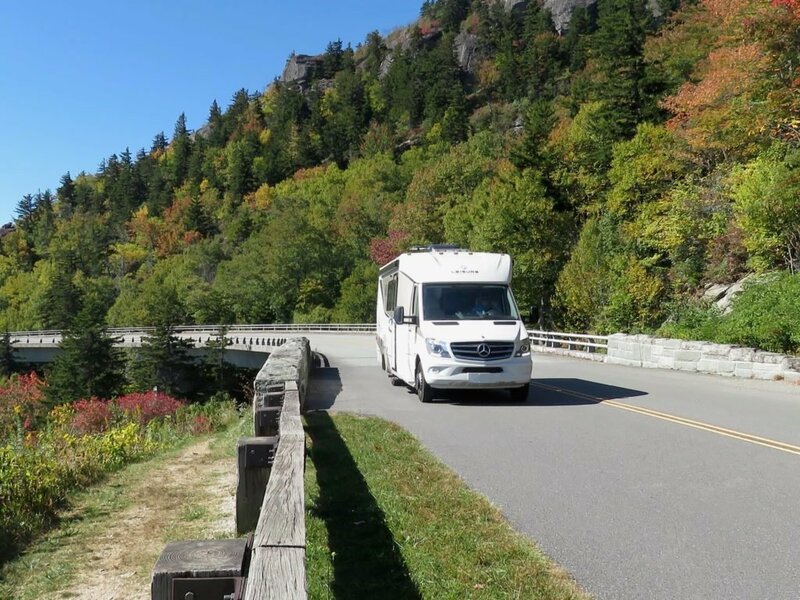 And, last fall, we headed “Lucky Us,” our 2015.5 Leisure Unity MB south from our Michigan home base to first spend some time in the Smokies, and then at Cherokee NC, hop aboard the Blue Ridge at its southern end/beginning. I was aware of some of what we’d see and do driving the bottom 200 or so miles on this trip. Denise wasn’t. But following spectacular vista after spectacular vista, interspersed with craft shops and Appalachian towns through three states that tempted with both scenery, history and food, we both were convinced to plan another trip to do the top half, plus a bit more. More on that in an upcoming article. We’ll also concentrate on the Smokies in a near-future story. This is about The Blue Ridge. The drive, the destination, The Blue Ridge. Most printed guides you’ll pick up actually begin at Milepost 0, logically enough, at Shenandoah National Park, to the north. Since we began in the Smokies, we went backwards, but we didn’t care. You shouldn’t either. You’ll enjoy the journey, and the incomparable mountain overlooks, quiet trails leading from eight rustic (your $20 nightly fee–$10 with a senior access pass–buys no power; our 200w of rooftop solar kept us going), but all have flush toilets, and some with showers, albeit some a bit dated, victims of years of federal park service de-funding, campgrounds conveniently built about every 58 miles, and glimpses of the lives of some of the residents here, from moguls to mountaintop nearly self-sufficient farmers, who gave up their lands to create this park. The highest mountain in the Eastern U.S. The deepest gorge in the Eastern U.S.
And hundreds upon hundreds of scenic pullouts, so many that after Day 1, you’ll be simply overwhelmed at what you’re seeing. That’s the reason to take your time. Remember this above all: most drives get you to your destination. On the Blue Ridge, the drive IS the destination. Plan on about 50 to 110 miles a day to stop, poke around neighboring towns, walk trails, and light a campfire or two. The BRP’s speed limit is 45, but considering the multiple stops you’ll be making, plan on a 30 mph average. Or, even less. Don’t rush this. Because by the second day, you’ll begin hearing the history encased in these ancient ridges whisper to you, from the waterfalls and trout streams, to hooting owls and eagles, to the echoes of voices of the fathers, mothers and children in the lone cabins still standing, where mountain families lived out their lives a long wagon ride from any town. Here are our highlights on the southern half. 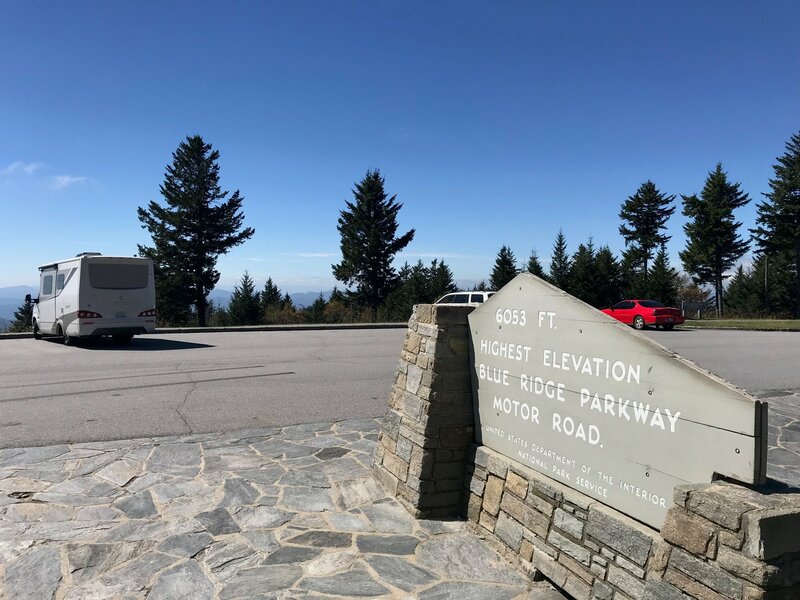 We hopped on the southern end of the BRP at Great Smoky Mountains National Park’s Oconaluftee Visitor Center, at Mile 469.1, near the Museum of the Cherokee Indian, the area’s first human inhabitants. The guides quickly caught our attention: height restriction warnings about some tunnels in the first 50 or so miles from that entrance. No worries for us, however, at least after we double-checked at the lowest tunnel, at 10 feet, 6 inches. That’s because it’s measured from the side of the tunnel, not the center. So with me walking behind just to be sure, we were feet below the tunnel’s rounded side, where many large RVs would be in danger of ripping the roof off if they didn’t stick to the center. One more advantage of a smaller RV. Once that was out of the way, we got down to some serious rubbernecking. 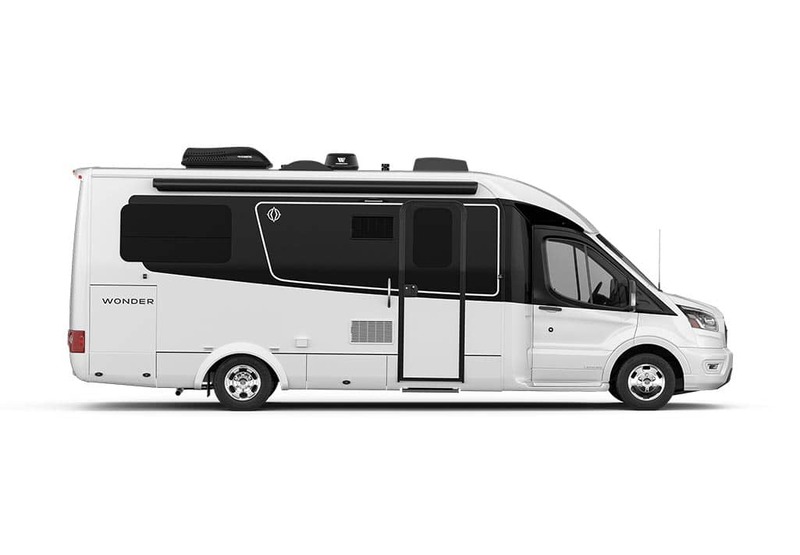 I was familiar with the BRP, but Denise was wondering what all the fuss was about. She quickly found out. As soon as we hopped on, we were climbing. Through, around and alongside mountains upwards of 6,400 feet. Not high by western standards, but in the east, almost Everest-like. 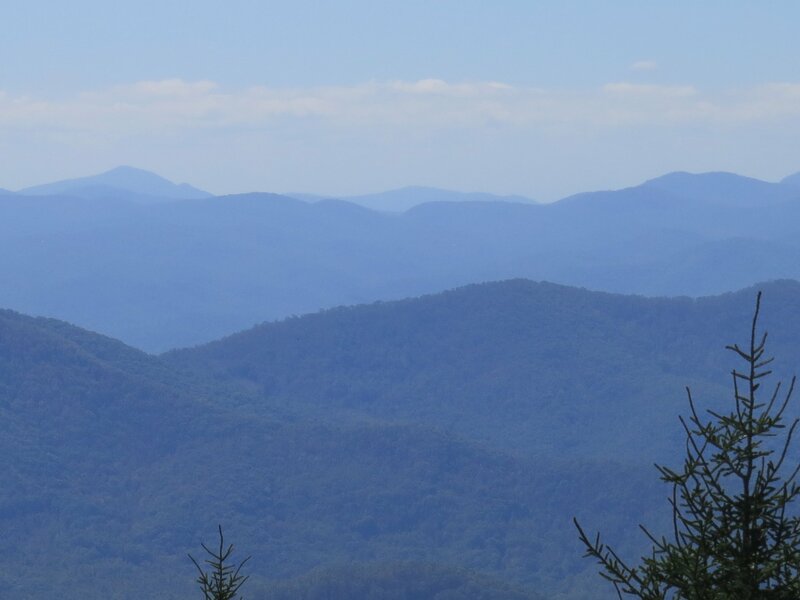 At Mile 451, is Waterrock Knob, named for a spring that quenched travelers from the Cherokee onwards. You’ll be looking at four states from here. Once past those low tunnels, we climbed another 20 miles to Richland Balsam Overlook, highest point on the parkway at 6,047 feet, or 6,400 feet, depending on the source, and who’s counting. Highest point you’ll drive to on the parkway. Looking out at the vistas of the Nantahala National Forest ahead and the Smokies already miles behind, we realized why we were here. “The layers of mountains and valleys, with the blue hue of it all, is simply spectacular,” Denise said. Well put. 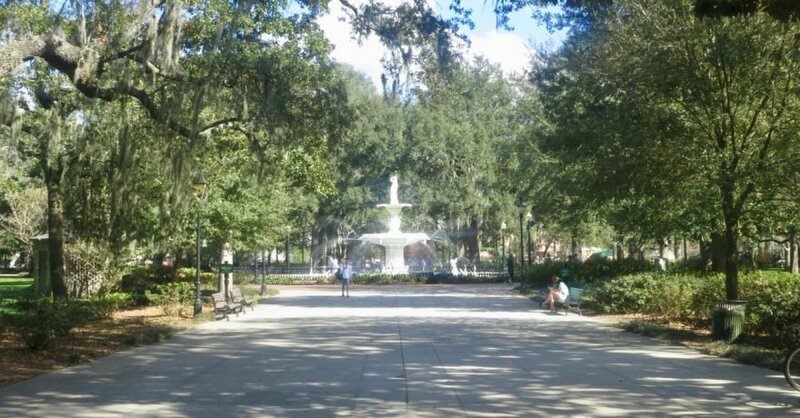 While we could have camped at private and state parks neighboring the parkway, we chose to stay within the park, at, for us, $10 per night with our senior parks pass. And we could have first stayed in the ridges at 4,900 feet at Mount Pisgah, formerly part of the vast Biltmore Estate of the Vanderbilt family, but the weather in September-October can be tricky that high. We opted instead to only take in the views. Besides, we just had to stop at the Parkway Visitor Center, mile 384, with exhibits about the Blue Ridge National Heritage Area we were traveling through. Typical of the park’s campgrounds are Julian Price Park and Doughton. Water still trickles from the springhouse at the nearby Brinegar Cabin, which was home for that family for decades. The site is now used for park service programs. It’s an easy walk from the campground through the woods and farm meadows. Campground settings like this at Doughton on the parkway more than make up for the lack of power. Cost? Just $10 a night with our NPS senior pass. Our solar cells and daily drives kept the lights on. Located just off the parkway, they, like other campgrounds, are well-marked, and we had no problem finding a site in early fall. Julian Price at mile 295 or so, features 193 sites. Price Lake, with canoe rentals and a hiking trail, is across the parkway from the campground. There are also other hiking trails in the area. Doughton, near mile 239, has 31 sites. 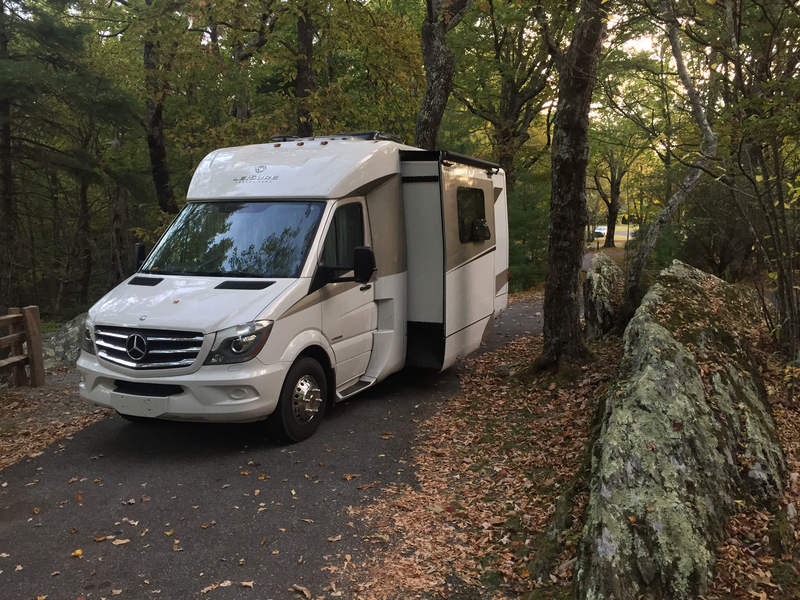 Our paved campsite featured a natural rock barrier between the circle drive and our spot, which overlooked more of the BRP’s beauty. 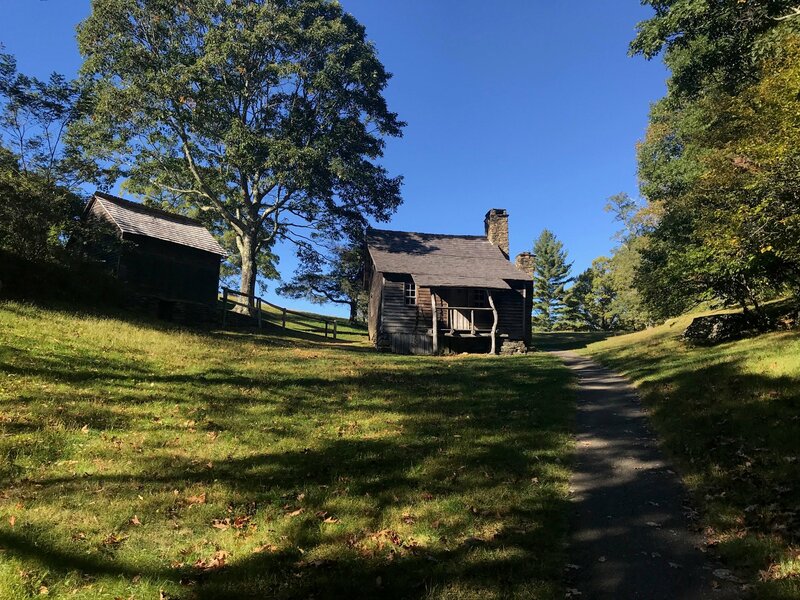 Take the mile or so walk through fields and woods, or drive instead, to Brinegar Cabin, where the Brinegar family literally carved out a farm homestead atop the mountain here in 1876 to raise crops and livestock. Martin and Caroline built the cabin around 1889, raised flax, and had an apple orchard and a granary. The sound of water still trickling from the homestead’s springhouse is just a sample of what it must have felt like to live here, miles from anyone else, with just the trees and wildlife for neighbors. In summer, the National Park Service uses the site for interpretive programs. Trade ya! Pick up a unique RV like this outside Wild Woody’s in Laurel Springs, NC, just off the Blue Ridge Parkway, unless someone beat ya to it! Wild Woody’s. Think Sturgis Rally year-round with a campground attached. Park yur hawg—or LTV– step inside for a brewski or two. Woody’s was empty when we visited in October, but I’m sure it’s packed in summer. 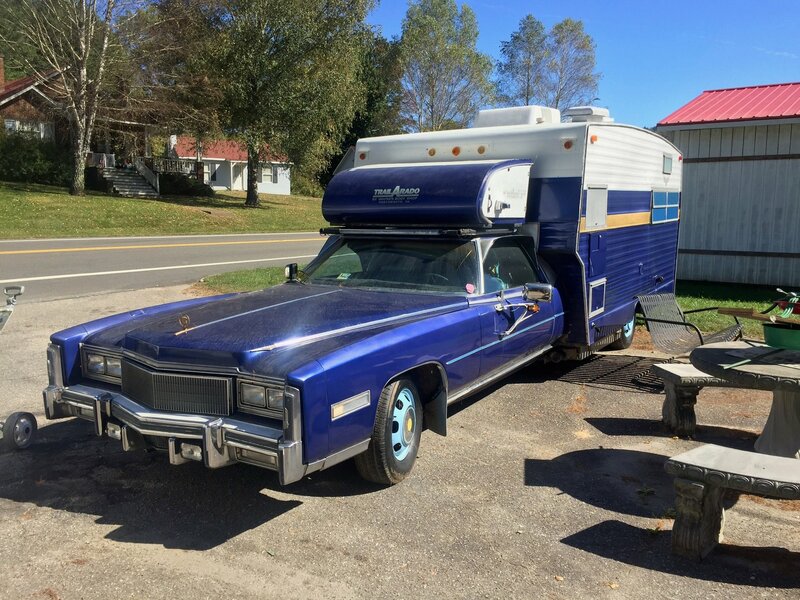 If it’s still there, check out the custom crystal metallic blue Caddy-turned RV parked nearby, replete with a chopped travel trailer bolted behind the front seat. It may still be for sale unless some lucky adventurer put a ‘sold’ sign on it after his or her fifth Bud. There’s also a campground, and you can preview your visit here. New River. You’re close to the New River at Laurel Springs, which is a misnomer. It’s recognized as the world’s second oldest river, 10 million to 360 million years new. You can take a leisurely canoe trip on the New—It’s also famous elsewhere for sphincter-tightening whitewater raft trips—at Dusty’s Trails Outfitters, which also has primitive camping. Everything from bluegrass and country, to rock-n-roll, owes its heritage to what happened in these hills, when Scots, English and others came to live here and brought their music and cultures. Those broadsides and ballads evolved over the centuries into the mountain tunes many of us know, then changed again by greats, including the man considered the father of modern bluegrass, Bill Monroe, and others like Doc Watson and the Stanley Brothers. It’s all told at the Blue Ridge Music Center at mile 213 on the parkway. If you’re lucky after touring the museum stick around for a concert (at least July through October), or take part in one of the free, local mini-events from noon to 4 p.m. every day the center is open. Which basically is every day. Do you play? Maybe they’ll even let you sit in. If you’re either a fan of NASCAR, or mountain music and bluegrass, come to Galax, VA, pronounced ˈ’ɡeɪlæks,’ maybe 15 minutes from the music center and about seven miles from the parkway. The town, named for an evergreen groundcover found across the Blue Ridge, is considered to be the center of “old time” mountain music, has a type of dulcimer named after it, and carries on that tradition with Friday night concerts at the theater downtown. It also is a destination for strummers and pickers following another famed route, The Crooked Road, a.k.a. Virginia’s Heritage Music Trail. The annual Old Fiddler’s Convention has taken place each August here since 1935. The annual Leaf and String Festival takes place in mid-June. Downtown’s Rex Theatre broadcasts a music show weekly live and online. If you get the idea that music is in the town’s soul, you’re right. So’s barbecue. The state BBQ championship, Smoke On The Mountain, takes over downtown in mid-July. If you can’t make it, a good place to sample what’s cookin’ at the festival is downtown’s Galax Smokehouse. Where? Just follow your nose to the corner of Main and Grayson. St. Louis-style ribs, pulled pork, smoked brisket, chicken and the like are all on the menu in this unpretentious and tasty stop. Parking your LTV is easy downtown. Check out the NASCAR memorabilia, and also if the Wood Brothers, the oldest active team in stock car racing, are checking out the menu. They’re regulars here. …on the Linn Cove Viaduct. This was the last piece of the parkway to be completed and was also the most complicated. In fact, when it was built it was considered the most complicated bridge ever attempted. The main issue: How to protect Grandfather Mountain, one of the world’s oldest peaks, and around which the viaduct bends. Started in 1983, its only 1,243 feet of precast concrete pieces on piers, but it took four years to build. Stop at the Visitor Center to understand the hows and whys of its construction. 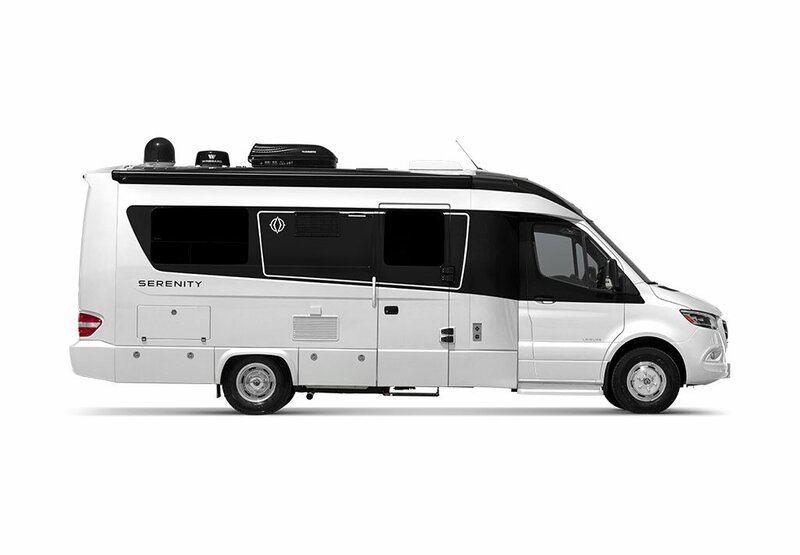 It affords sweeping views of the surrounding mountains, as well as making for great photo ops at either end, where you can park while your partner stands by to snap a perfect shot of your LTV rounding the “S” curve. Plan a stop at the Park Service’s Visitor Center at mile 384, and the Folk Art Center near Asheville, NC at mile 382. It’s not only a museum of mountain crafts but you can also buy to your credit card’s limit here. During the tourist season, talk with local craftsmen. Hiking is another draw. At almost every stop and overlook there’s a trail, including the Mountains-to-Sea Trail, which runs, well, from these mountains, to the Atlantic coast, leading to the woods, a trout stream, or other feature. Asheville’s Biltmore estate, built by the Vanderbilts from 1889-1895, opened for tours in 1930 to increase tourism which crashed like everything else during the Depression. There’s even a hotel there now. That’s just a preview of the parkway’s southern half. We’ll be sure to take you along when we do the rest. Yup, Hurricane Florence had its way with the entire southern Appalachian area. So before you go this year, check for updates by calling the park, or monitoring its website, or other associated sites. For information on many of the spots mentioned, just click on the provided links. Michigan-based Leisure Explorers Bill and Denise Semion use their more than 75 years combined writing and photography experience to bring you along on their adventures across the U.S. and Canada in their 2015.5 Unity MB. And, sometimes their two cats join in on their journeys. Bill is an award-winning travel/outdoor writer and author of two travel books. Denise is an accomplished photographer and outdoor communicator.